We've been following Guyana Goldstrike GYA for well over a year now and for a lot of good reasons. It's not only the company we tend to follow but also the country of Guyana itself and what's happening with some of the other juniors that are in the country. Reason being, what's happens to one company can effect another. But getting back to Guyana Goldstrike, it's one of the few juniors that has been able to raise capital this year and have an active on going exploration program. Before we get into any details of what the company plans to do in the coming year, we'll take a quick look back at what the company has accomplished in 2018 and we might be able to project where the company will be in in 2019. 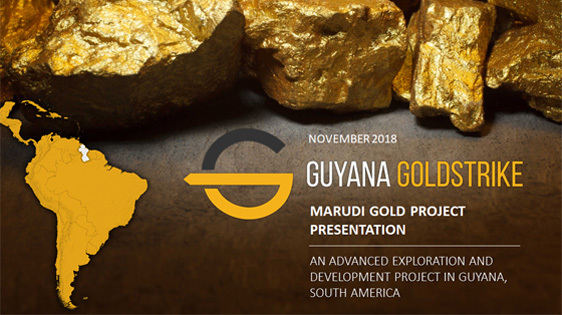 For starters, for those who are unfamiliar with Guyana Goldstrike, the company is exploring an area called Marudi in the South American country of Guyana. This property had been explored by various other juniors over the years but CEO Peter Berdusco and senior geologist Locke Goldsmith have taken different approach to exploring this property by methodically sampling and trenching the areas of interest. Using existing data from previous explorers and then expanding on those results the company has been able to define these areas of interest. A person only has to look at the 2018 year of news releases to see the vast amount of work along with the results that have been accomplished to date. Almost every two weeks there was an updated news release of sampling, trenching or assays. Some of the news started hitting the wires as early as January 2018. One of the first news releases was January 23 when the company announced an indicated 259,100 gold ounces within 4,428,000 tonnes grading 1.80 grams/tonne (g/t) and an inferred resource of 86,200 gold ounces within 1,653,000 tonnes grading 1.60 grams/tonne (g/t). It was because of news like this that on February 27 the company released news stating that the Zijin Mining Group of China was buying into the company for a total of 3.4 million dollars. Following the input of capital from Zijin Mining, the company embarked on a trenching and sampling program in the Paunch area and in May the first batch of assays became known. There was some very immpressive grades such as 7.45 g/t gold. This led to a new discovery as most of the past confirmed results were in an area known as Marudi North and this news find was approximately 1.5 KM away. Then at the beginning of June the company issued news of additional assays from the Paunch area of 5.98 g/t gold. These results were from 166 m2 of trenching where over 100 samples were taken. After looking at all the previous and most recent results at the end of June the company then issued news of a high resolution airborne geophysical survey over the entire 13,500 acre area of the Marudi Gold Project ("Marudi") using magnetic and radiometric systems. This was the first ever detailed airborne geophysical survey ever conducted on Marudi gold project. In mid July the company the company reported a new discovery of gold mineralization at an area known as Toucan Ridge. This discovery lead to news a few weekes later that the company had trenched over 100 meteres of quartzite-metachert which is a host rock for gold. 33 samples were taken for fire assay. Of these, eight were re-assayed for total metallic content with assays as high as 1.53 g/t gold. 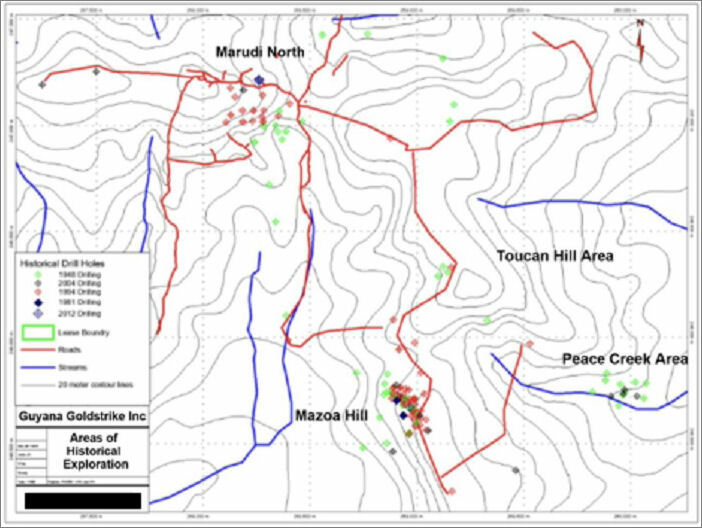 From July onward the company has focused a lot of attention on the Toucan Ridge area and assay results have been proven that this is an area of high interest. Assays results of this trenching program have been consistant with results like 5.32 g.t over 3.00 meters, 7.21 g/t over 3.00 meters, 3.29 g/t over 8.40 meters and 3.63 g/t over 1.8 meters. Now that we've reviewed what the company has accomplished in 2018 it's time to take a peek and see what the possiblities are for 2019. With all the information the company needed, on November 8 the company issued news stating that it was soliciting and reviewing bids from drilling contractors for the right to diamond drill the Company's Marudi Gold Project. The planned phase one drilling will focus on Toucan Ridge which is the new gold discovery area at Marudi. The phase one target zones will focus on the multiple trench sites along the Toucan Ridge which have successfully confirmed gold mineralization. Target zones will be further defined once the magnetic and radiometric survey report has been completed and then reviewed by the technical team. Now here is something that is really interesting. I always save the best for last. On November 16 there was a publication on Reuters News that talks about Barrick Gold and Guyana. "Barrick Gold is interested in early-stage exploration in South America's Guyana Shield and wants "more exposure" in Canada, Executive Vice President of Exploration Rob Krcmarov said in an investor presentation Friday." Barrick has a 15-percent stake in Reunion Gold, an exploration company active in the Guyana Shield. This is a classic case of follow the money. When big players are out looking for addtional resources and reserves you'll want to be holding stock in one of those companies. On December 14, Barrick announced the company has agreed to acquire up to an additional 12,600,000 common shares of Reunion at a price of $0.18 per share. The aggregate consideration to be paid by Barrick in the offering is $2,268,000. The Reunion offering is expected to close on or about December 20, 2018. So to wrap things up here, we see Guyana as a country with huge potential, Guyana Goldstrike as a company with a massive amount of upside potential given their previous work and up coming 2019 drill program along with major big gold companies sniffing around. 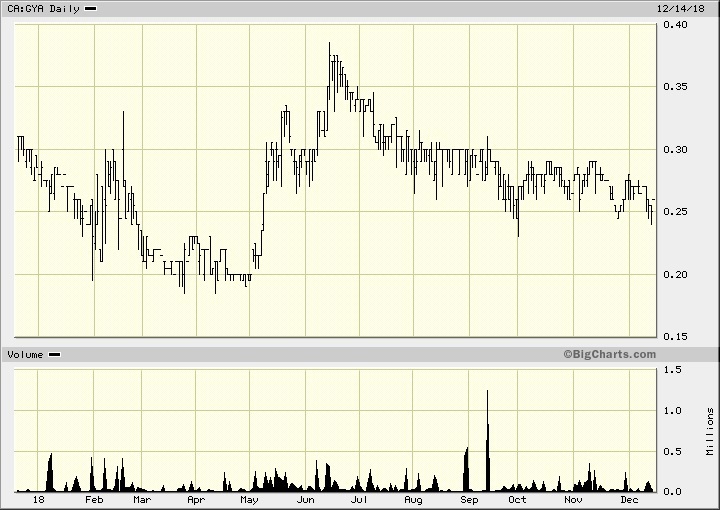 Guyana Goldstrike has 50 million share O/S and stock price of about 25 cents. Looking at the chart above the stock price has held up well compared to about 80% of the junior miners who are seeing 52 week lows in their stock prices.